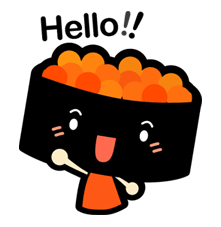 http://www.line-stickers.com/ – Sushi Ornament Line Sticker | Sushi Express presents you the cutest Sushi character in LINE. It’s free to download from 1/15 to 4/14. Download it now to make your message “yummier”! Copyright: Copyright © Sushi Express CO., LTD.